Screen Printing vs. Pad Printing: What’s The Difference? When you create promotional products or certain other types of printed, three-dimensional marketing collateral, there’s a good chance you’ll end up using one of two different printing methods: screen printing or pad printing. Though it’s typically best to entrust the actual printing to experts, it never hurts to learn the definition and the difference between screen and pad printing so that you can understand the precise process your design will go through. Screen printing (or silk screening) uses a mesh stencil through which ink is transferred to your material. Typically, this involves first coating a steel, nylon or polyester screen mesh with emulsion that blocks all openings in the screen except for the stencil area. 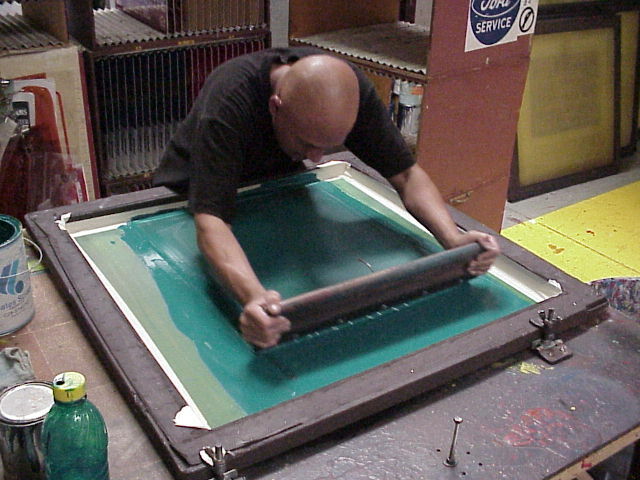 The screen is placed above the material to be printed and ink is pressed through the open holes using a roller or squeegee. This silk screen press is used to apply ink to the material underneath it. 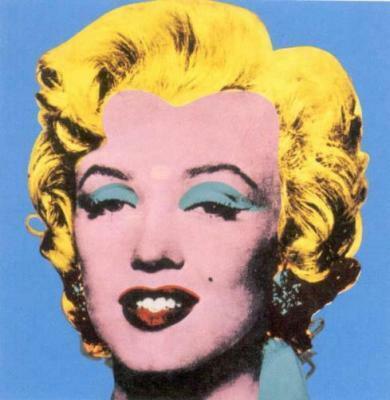 Andy Warhol's infamous "Marilyn" prints were created using screen printing. The technique dates back to early China (between 960 and 1279 AD) and has been popularized by many modern-day artists including Andy Warhol, who used screen printing to make those famous colorful prints of Marilyn Monroe and Elvis Presley. The technique rapidly caught on thanks to its low cost and easy access. Professional screen printing has, of course, become significantly more sophisticated and accurate since the 1960s. Automatic printing presses have helped streamline the process to make it incredibly efficient. Today it’s commonly used to create custom t-shirts, drinkware and other promotional products. Images printed using screen printing tend to look very sharp, clean and high-quality. The process is also fast, inexpensive, and provides excellent ink opacity (the ability of ink to conceal the material underneath it). Screen prints do, however, have certain disadvantages. For one, it’s not the optimal process to use when working with very fine detail. There’s also the fact that different ink colors in a multicolored image must be applied separately. With the screen printing process, this means that there’s a possibility of the product moving slightly (up to 1/8 of an inch) and creating minor discrepancies in the way each color is applied. This is referred to as an issue with registration. Screen printing does allow for overprinting (printing one color on top of another), which may help to correct this misalignment. The box on the right shows a correctly aligned image, while the box on the left reveals a registration error. 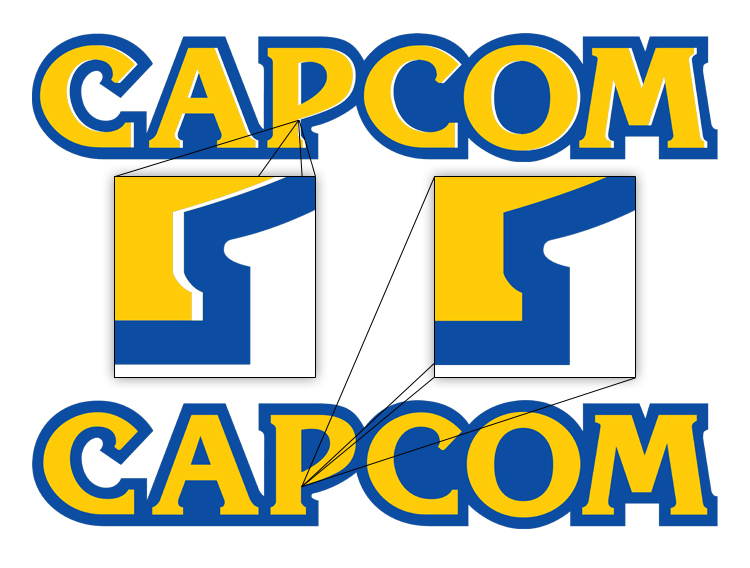 Notice how the color yellow has been shifted slightly to the left, leaving white space. Ultimately, screen printing is a very quick and effective method except when you want to create a printed product with intricate detail or multiple colors on more than one side. As the name suggests, pad printing involves transferring ink from a silicone pad to the object you want printed. Think of it as a process similar to using the rubber stamps that hobbyists often collect (though it’s obviously a bit more advanced than that). Using a machine that holds both the pad and the promotional product steady, the pad is pressed into an inked plate etched into the shape of your desired artwork. The pad is then pressed into the actual object, creating a crisp printed image. 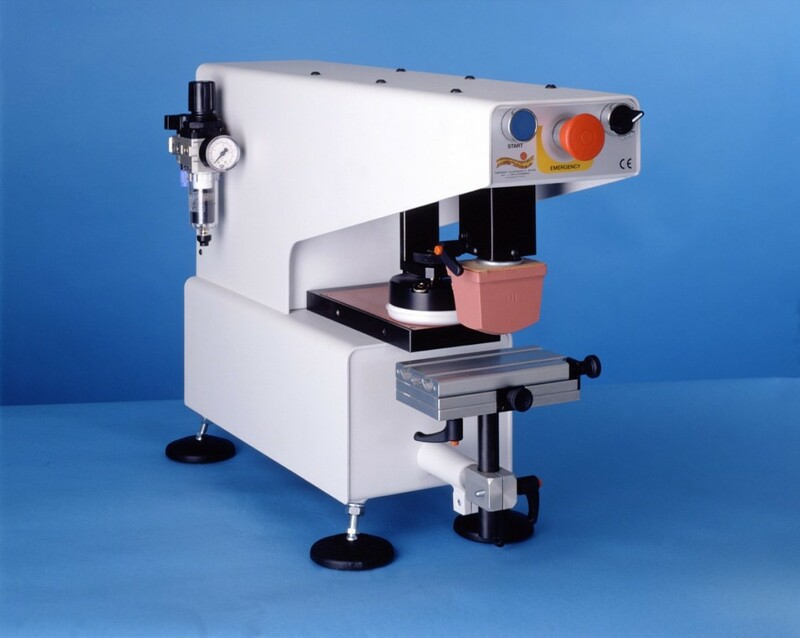 This pad printing machine uses what is essentially an advanced stamping process. 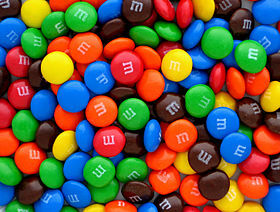 The white letter M's on these candies were created using a form of pad printing. Unlike screen printing, pad printing is a relatively modern process, though it did also achieve mainstream notoriety in the 1960s. Since the technique’s primary advantage was that it could be used to print unusually shaped objects that couldn’t normally be printed, it became extremely popular in the Swiss watchmaking industry. Silicone, ink, and plate technology gradually improved over time. Now, using robotic machinery and even laser guided systems, everything from coasters to plates to coffee mugs can be pad printed. The technique is even used to print edible “ink” on certain types of candy. The process provides excellent resolution, making it a better option when working with halftones, defined edges, and other fine details. However pad printing is limited in terms of speed, print area and ink opacity, and it can sometimes create slight variations in tone on large, solid areas of color. Multiple colors must still be applied separately during pad printing, which means that registration errors may occur. Pad printing is quite reliable, albeit slower and more expensive. Overall, it’s the technique of choice for unusually shaped promotional products, especially those with delicately printed details. Both screen printing and pad printing are revolutionary techniques that completely changed the way we create promotional products. Each has its own strengths and weaknesses, but as technology continues to evolve, we may discover new applications and improvements that make printing even more effective. Together, these processes make it possible to turn ordinary objects into colorful works of art. Hi, What is the brand name of the desktop pad printer you show here? It’s a Tampograf TG30 1-color. Hope that helps! The pad printing machine looks very nice! Great article, it was really helpful, it gives knowledge which differentiate the pad and screen printing, I really agree that both of them have their own advantages that really depend on what is necessary or need.